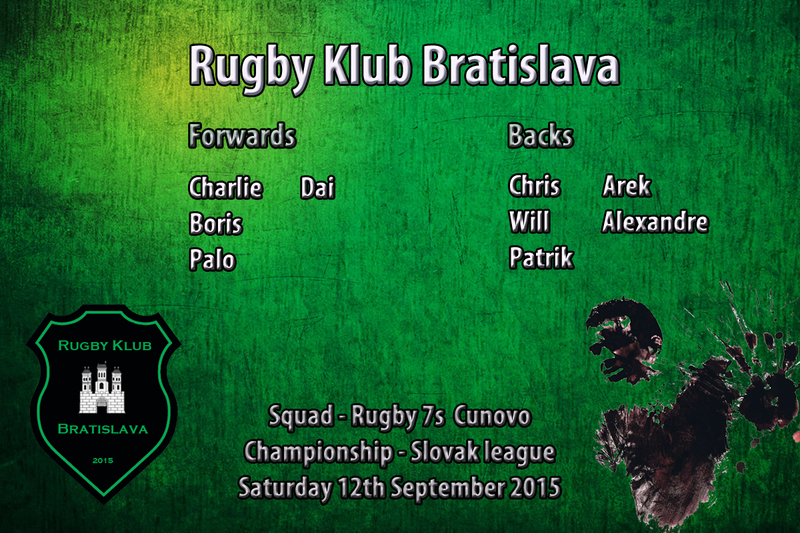 Rugby Klub Bratislava took part in its first official tournament this Saturday 12th September 2015. With a squad of 9 motivated and well prepared players, RKB faced off against 4 other clubs: Zilina, Slovan Bratislava, Trnava, Zilina, and Kosice. While waiting for the first match to start, RKB rehearsed the basic movements of rugby 7s, including the scrum, line-out, and kick off. Coached by Will, the team gained more and more confidence during the warm up, which was a great way to begin the tournament with determination and high morale. At the same time, Chris led the group during the competition, doing his best to keep the ball alive, to encourage passing and making sure the ball got to the runners. However, after an ugly tackle made by Trnava, which was not penalized even though he didn’t have the ball, his shoulder couldn’t resist anymore and it was decided to make a change. During the tournament, the team was organised between forwards and backs, making the most of each player’s skills, fitness and, more importantly, experience. For the forwards, some great comments for Palo who has proved for the second time his ability to learn quickly; for Boris who has put tremendous effort and energy to resist the heavier and more experienced opponents in the scrum; Dai with his many skills was seen all over the pitch; and Charlie getting involved in all the big hits and trying to steal the ball inside the ruck. For the backs, Will brought all his experience and his strength into complicated situations and was a good kicker; Arek who proved he could play different positions and with fantastic handling skills under pressure; Alexandre who was able to outpace nearly everyone else during the competition, and was often the target of every pass looking to take advantage of a hole in the defense; and finally Patrik who discovered his first real rugby 7s tournament, always looking to find space across the back line and secure the defense as much as possible. Finishing with a cold beer and barbequed chicken sandwich, the atmosphere was fantastic and gave us all a great opportunity to chat with other players, friend and foe alike.